A Nutritious & Varied DIET is one of the central CornerStones to a Cave & Modern Dog’s Healthy Diet. 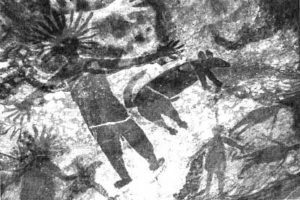 The forebears of our Animal’s were Hunters ( and Gathers when they were not Successful with “The Hunt”). It was not that long ago, that your Dog’s Ancestors were teaming up with their 2 Legged “Co-Hunters” in search of any Food Source they could find / capture or Scavenge. However, just because they were Hunters does not mean that their Diet consisted entirely of Animal Muscle Tissue that we today normally call Meat. When a Cave Dog Killed a Rabbit, it typically went directly to the Belly, devouring the (PreDigested) contents of the Stomach ( Non-Meats ), as well as the other Nutrient Rich Internal Organs, such as the Heart, Liver & Kidneys. Hard Meats from the Shoulder or Haunch were eventually Eaten, but were Clearly Secondary in Taste / Nutritional Importance. The primary components of this All-Organic Diet for our Cave Dogs consisted of Organ Meats & Half Digested Greens & Grains “Borrowed” from their Herbivorous Prey. 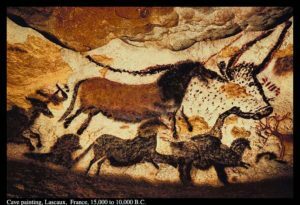 Using this Cave Dog DIET Template, it is clear that an “All-Meat” Diet for our Modern Dogs ( especially “Just” Hard Meats ) may not Mirror that of their Cave Ancestors. How your Animal Can Eat Like a Modern CAVE Dog. Have you ever pored over a Pet Food Bag and its ingredient List, comparing & contrasting the Information ? Unfortunately, despite what it may say about Qulaity or Grade, the Packaging can’t tell You about the Quality of the Food Inside. This is by Regulatory Design. That while the Association of American FEED Control Officials (AAFCO) DOES develope & implement Standards for the Manufacture, Distribution, and Sale of Animal Food. AAFCO Does NOT Allow Any References for the Quality or Grade of an Ingredient, so if a Food says it’s of High Quality or Grade, this should Not be taken as Fact by Pet Parent or Animal. So…. What’s a PET Parent to DO ? How do I find the Right FOOD for my Modern CAVE Dog ? To this Question, Healthy GOO defers to Your own Research, the Mountains of BOOKs & Animal Professional Blogs dedicated to this Topic, Discussions with fellow Pet Parents and finally a Consult with your DVM. Then once your Diet Decision has been made, its time to introduce your DIET Decision to Your Dog and See What Happens. After all, at the End of the Day, it is your Animal who is the Best & Final Judge of what Food is Right for It. However, when it comes to FOOD Health / GI Issues / FOOD Sensitivities / InTolerance’s & Allergies and the GI Health of your Dog, Healthy GOO and GOO GUT RESCUE Does have a few Suggestions. But there is more to GOO GUT RESCUE than the “GUT” ! While at first review, GOO GUT RESCUE may appear to be exclusively GUT / GI Tract ” Focused “, there is More to GOO GUT RESCUE than the name implies. You see, in addition to achieving a Healthy & Balanced GI MicroBiome, Dr. Kristin has also focused on “How” your Animal’s System “SEE’s / Reacts” to the various FOOD / Protein Sources that it Eats. 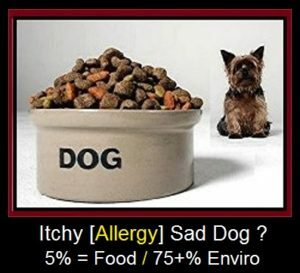 By this we mean, that while only 5% of our Canine Allergy / Atopy population actually suffer from “True” FOOD Allergies, this does not mean that FOODs are not without their Health Issues. That it is possible, even likely, that some of the most common and basic FOODs that your Animal eats may be causing FOOD Difficulties because your Animal’s GI GUT is Pathogenic Dominated / Compromised and with it, Normal / Daily GUT Functionality is impaired. ALL adding up to your Animal’s GUT unable to handle / process even normal FOODs, thereby causing FOOD Issues. So, As We Said … What’s a PET Parent to DO ? To this FOOD Issue Challenge, Healthy GOO’s DVM Allergist Consultant, in addition to RESCUE’ing Your Animal’s MicroFlora, has also included a very exciting and Forward Thinking aspect of GUT RESCUE that she has Successfully used in her 1st Healthy GOO Product called Doggy GOO. You see, just as Doggy GOO uses Enviro Allergy Ingredients together with GOO’s Delivery to build Tolerance against building Enviro Allergy Sources in Doggy GOO, so to with GOO GUT RESCUE which uses FOOD concentrates and GOO’s Delivery to build Tolerance to 7 common “TroubleMaker” FOODs ( Meat & Non-Meat ). That with every Lick / Lick / Lick of GOO GUT RESCUE, small traces of 7 everyday FOODs are brought into your Animal’s Mouth.. where the Mouth is Slathered with GOO Juice .. where the FOOD Ingredients are Bio-Availability Absorbed into the BloodStream thru the thin Skin of the Animal’s Mouth .. where they begin to build Tolerance to these provocative FOODs. It is thru this Dual Action Strategy / Goal of building FOOD Tolerance together with RESCUE’ing the GUT’s MicroBiome, that will allow your Animal to Eat from the Full Multi-Nutritious Bounty of FOODs that are available to them without concern for FOOD PushBack. Healthy GOO’s DVM Allergist Consultant has selected the following FOODs to be included in GOO GUT RESCUE : Beef, Pork, Chicken, Lamb, Wheat, Corn & Soy. #1) Heal & Seal the GUT’s Lining whose Integrity has become Porous & Compromised by extended presence of Pathogenic Bacteria Dominance. #2) RESCUE the GUT from Pathogenic Bacteria Dominance > ReStore the GUT with GOOD Bacteria > ReTain this Beneficial GOOD Bacteria Profile. #3) ReSOLVE FOOD ReActions / Health Issues caused by an Out-of-Balance GUT by Building Tolerance to 7 provocative / everyday FOODs > Allowing Your Animal to eat a Nutritious / Varied DIET. Because Antibiotics Do Not Discriminate between the BAD Bacteria that they are Targeted to Kill and the Beneficial GOOD Bacteria that is Critical to everyday GUT Functionality & Health, it is suggested ( Of course after a discussion with your DVM ), that GOO GUT RESCUE be introduced during the Final 25% Stage of your Animal’s Antibiotic Protocol ( 3 Hr after Antibiotics are taken ), and continued at a “Stressed Level” for the duration of the Antibiotic Protocol and for approximately 3 months or until Health Improvement is Achieved. Then Fall Back to “Well Levels” and Monitor for continued Health or possible GUT Health Re-Lapse. By following this Strategy, It is GOO GUT RESCUE’s Intent to Pre-Emptively begin to establish a “Good Bacteria” presence Before Antibiotic DisContinuance and Before Opportunistic “Bad Bacteria” has a chance to Re-Occupy your Animal’s GUT MicroBiome. As well as to Continue to Heal & Seal your Animal’s GUT Integrity and maintain a Healthy Floa Balance thereafter. Healthy GOO ™ suggests the following Pet Parent Friendly Feeding Instructions. Upon receiving your GOO GUT RESCUE ™, it is suggested that you place your GOO in the Refrigerator. This will ensure maximum Product Freshness / GOO Effectiveness for the Life of the GOO. Healthy GOO ™ recommends continued refrigeration until Your Animal totally Licks Up Their GOO / Completely Consumed. As an added Comment, some Pet Parents have their GOO shipped to their Attention at Work to ensure Delivery. Step 2: Determine the Health Status of your Dog. Is your Dog Well or Stressed? Has your Pet been diagnosed with an illness? Have you noticed any signs that your Pet may be fighting health issues (such as Lethargy, Skin, Ear, Allergy or GI issues)? Have you noticed any abnormal Behaviors? If you have answered ‘Yes’ to more than one of these Questions, we consider your Pet’s Health and Well-Being to be ” Stressed “.Of course, in all matters relating to the Health of your Animal, We strongly suggest Keeping your DVM in the Loop as to your introduction of GOO GUT RESCUE to your Animal’s Health Picture. Step 3: Determine How much GOO GUT RESCUE ™ is Best for your Dog. Once you have determined if your Dog is “Well” or “Stressed”,You need to weigh them. Once your Dog’s Weight has been determined, use the GOO Table below to determine the correct amount of GOO GUT RESCUE ™ for your Dog. Please Note that for the First Week or so, GOO recommends that you start your Animal at a WELL Amount / Day, allowing your Dog ( and their GI System ) to Slowly acclimate before you move to a Stressed Amount. Once you feel that your Animal is tolerating their GOO GUT RESCUE, then move to your targeted Stressed Amount / Day. While it may seem Inconsequential, the type and design of the bowl to be used for GOO GUT RESCUE™ is important. Healthy GOO ™ suggests a Bowl that has a broad, flat bottom with slightly angled sides. The reason for this is that GOO GUT RESCUE ™ must be Thinly Spread over as broad an area as possible. This type of Bowl will allow your Dog to conveniently and repeatedly Lick Up their GOO GUT RESCUE ™. The surface onto which you place the bowl is just as important as the Bowl itself. Because GOO GUT RESCUE ™ consumption is all about Vigorous Lcking, the Bowl must be placed on a surface where it will Stay Put and not move around as the Dog repeatedly Licks UP their GOO. Step 5: Spread the GOO Very, Very ( Did we say Very ) Thinly ! Now that you have the right Bowl and the right Place, it is time to grab a Teaspoon ( the Small One, not the Big One / Tablespoon). After Opening… thoroughly / vigorously Mix the entire contents of your GOO GUT RESCUE ™ being sure to get to the Corners of the Container in that GOO’s Nut Butter / Peanut Oil will have separated over time. Based on your Dog’s Weight and Health Status, Spoon out the correct Amount (see GOO GUT RESCUE ™ Feeding Frequency below) for your Dog and Spread it Very Thinly / almost to the Point of Invisibility around the Bottom of the Bowl. While you may think this “Spread Very Thinly” request is a bit GOO Crazy, Please be assured that there is GOO Method to GOO’s Crazzzy-ness ! Speaking to this GOO Crazzzy-ness, here is the “GOO Method” behind GOO GUT RESCUE’s Ingredients, in that each Ingredient Group in RESCUE has its own Method of Delivering their maximum Healthy GOO Glow ™ to your Dog’s GI Immune System. In the case of GOO GUT RESCUE’s Ingredients, some Ingredients require “Sublingual” Delivery i.e. Lick / Lick / Lick, while others only need to be “Digested “ i.e. Down the Gullet. For GOO GUT RESCUE… The FOOD Ingredients i.e. Beef, Lamb, Pork, Chicken, Wheat, Corn & Soy require that they be “Delivered” via GOO’s proprietary Lick / Lick / Lick Sublingual Format, such that with every Lick of GOO GUT RESCUE, small amounts of GOO are brought into your Dog’s Mouth, where the Mouth is Slathered with Peanut Butter / GOO Juice, where the FOOD Ingredients are then Bio-Availability Absorbed into the Animal’s Blood / Immune System via the thin Mucosal Skin of the Dog’s Mouth, where they begin to build Tolerance to these specific Foods. The PreBiotics / ProBiotics, Colostrum & Omega Ingredients ( and GOO-Licious Peanut Butter ) need only Tag Along with the Lick / Lick / Lick, where they are then Swallowed and begin to Work their GOO GUT RESCUE Magic “DownStream”. Step 6: It’s GOO GUT RESCUE ™ Time! Now it’s time to give your Best Friend their Healthy GOO ™ GOO GUT RESCUE ™ Tasty Treat! Place the GOO GUT RESCUE ™ Bowl in the Right Place per above, stand back and let your Best Friend Lick / Lick / Lick UP their GOO until there “Ain’t No More !”. a “Treat”, but rather a Canine GI Immune Health Supplement, which has been formulated specifically to be ingested in the specified amounts. If you “Must” give your Animal More GOO Lick Time, You can add “a little” extra 100% Natural Peanut Butter, but do not modify the suggested RESCUE Amount and Please Do Not Overdue it with the PB ? While it is “OK” to give your Animal the suggested Daily Amount in a 1X Frequency / Day. It is the feeling of Healthy GOO that the Daily suggested RESCUE Dose can be administered in a 2X / AM & PM Frequency. Please adhere to the indicated Consumption amounts listed on your GOO GUT RESCUE Label and per above. Ingestion beyond these specified amounts may lead to G.I. Distress. 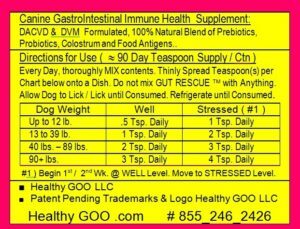 Doggy GOO ™ is a Canine GI Immune System Health Supplement; Please keep out of reach of Children. Peanut Allergy Warning! Not for Your Animal, But for Humans ! Doggy GOO ™ uses 100% Natural / Human Grade, Peanut Nut Butter. As such, we strongly suggest that GOO GUT RESCUE ™ not be used in Households where someone suffers from an extreme ( Epi-Pen ) Peanut Allergy. Please also be mindful of Household Visitors that may have a Peanut Allergy. PLUS … While your DOG’s GOO Bowl may “Appear” to be GOO Empty, it is likely that Your Dog’s Bowl may have lingering amounts of Peanut Butter. For maximum GOO GUT RESCUE ™ Ingredient Freshness, it is suggested that GOO GUT RESCUE ™ be refrigerated right after purchase / upon Receipt and until it is fully Consumed. Please Review ALL Health Measures with your DVM. Reminder: Healthy GOO ™ is proud to be as GREEN as possible. GOO’s GREEN Mantra = Only “Buy” when Necessary > Re-Use > Re-Cycle. Given this Goal, once your GOO GUT RESCUE ™ is GOO gone, the 16 oz Re-Usable, Leak-Proof, Dishwasher Proof / Microwave-Safe, and BPA-Free GOO Container is perfect for Food Storage / ReUse.